After a robust experience in Procurement/Purchasing within both Supply Chain and Finance departments, Gianpiero managed the Supply Chain Deptartment in a Biotech Fill&Finish Manufacturing Operations Site. He developed a sound expertise in Supply Chain Management, responsibility for Logistics, Purchasing, Production Planning and Sales&Distribution activities. More than 10 years of experience sponsoring or leading many projects. Lately, he has been appointed to a new big task, the addition of the Packaging Operations of the Site with his scope. 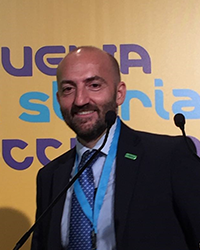 In the frame of supporting and sustaining the As One For Patient program of Merck, Gianpiero has been appointed as Change Agent, joining a global active community. Supporting and sustaining the business DIGITAL development era. He is also experienced in Facility and General Services contracts management, certified as Lean Six Sigma Green Belt. Fluent in English, good in German. He likes international environments, liaises with people and manages teams, creative and comfortable on decision making. He has been studying abroad in the US at University of Pittsburgh and in Germany at Universitaet Augsburg and Freie Universitaet Berlin. He worked as Buyer of production materials of European, US + Far East markets with success and recognition; experienced in managing Purchasing/Procurement processes, Logistics and Supply Chain management.